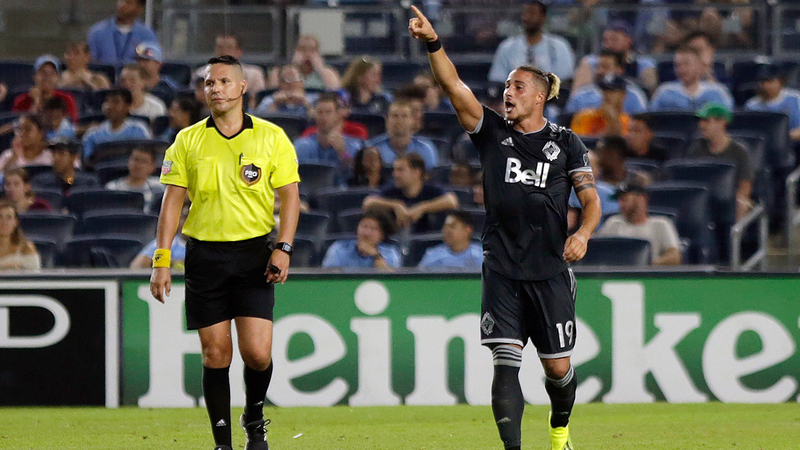 Despite a rotated lineup, the Vancouver Whitecaps managed to pick up a vital point in the Bronx after drawing 2-2 with New York City FC on Saturday. Even though NYCFC dominated the majority of the match, a couple of substitutions early in the second half helped swing the momentum of the game for Vancouver, which led to the decisive equalizer. Whitecaps head coach Carl Robinson seldom throws on a substitute before the hour mark of a game. But after conceding an early goal in the second half, Robinson had to react. Down 2-1, Robinson quickly hauled off Bernie Ibini for Alphonso Davies. He also swapped striker Anthony Blondell for Erik Hurtado, who provided more pace up front, and a willingness to close down the opposition defence. Davies was especially key. The NYCFC spent the first half camped inside the Whitecaps’ half of the pitch, but once Davies came on, the back line had to retreat in order to nullify the threat. 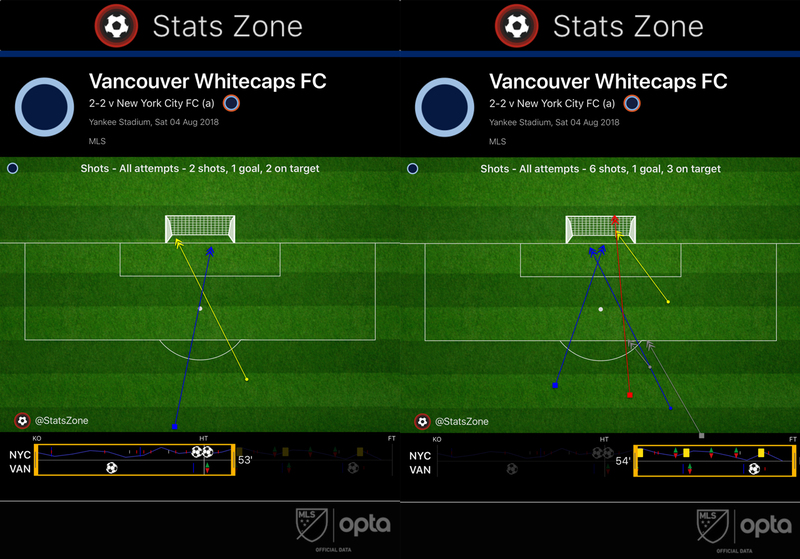 Before he checked into the match, the Whitecaps registered just two shots in the opening 53 minutes. Vancouver mustered another six after Davies’s inclusion. NYCFC’s failure to convert more off the team’s 22 shots was an obvious factor. But the addition of a livewire like Davies in the final third is what the Whitecaps were sorely missing. Eventually, more space opened up for the attack and it worked out. Yes, the Whitecaps usually rely on a structured defence and a counter-attacking system. However, when that same back line is allowing two goals per game this season, maintaining control in the midfield can alleviate some of the pressure. Unfortunately for Vancouver, this is seldom the case. The midfield’s passing was quite erratic and had issues bypassing NYCFC’s press. There was an improvement in the second half but it was still lacking. 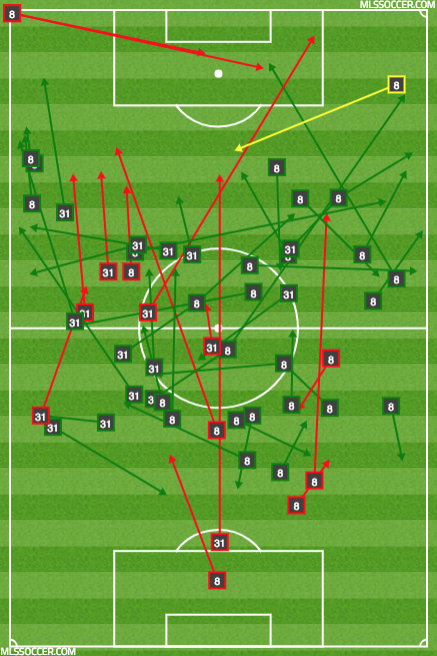 Combined pass map for Russell Teibert (31) and Felipe (8), via MLSSoccer.com. Teibert is not exactly a distributor but Felipe is a very strong passer. However, both players were pretty far apart from one another and the team in general lacked any sort of disciplined shape, as seen below. Whitecaps average positioning, via SofaScore. This, in turn, allowed NYCFC to dictate the tempo while Vancouver’s defence was essentially under siege. NYCFC was wasteful with its finishing, but that won’t always be the case. If the Whitecaps are in a similar situation on Wednesday against Toronto FC, they might not be as fortunate. The final result might have been a lot different if Stefan Marinovic didn’t make a crucial save early in the match. In the opening moments of the game, Maxi Moralez picked out Jo Ings Berget with a cross into the box. The Norwegian striker won the header and appeared to have the opener, but Marinovic managed to get down in time and parry the ball out of harm’s way. Had the Whitecaps conceded after a few minutes, the complexion of the game could’ve been completely different. Marinovic hasn’t been in stellar form since his return from injury, but perhaps that highlight-reel save will spur him on in these final 11 matches of the regular season.